These posthumously published tomes by Richard Armour ’27 were edited by his son, Geoff Armour ’63. Axioms to Grind includes 900 of Armour’s famed aphorisms. Rhyme and Punishment is his autobiography. 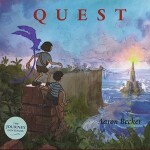 In the visually stunning sequel to his Caldecott Honor-winning picture book Journey, Aaron Becker ’96 offers the second installment in an intended trilogy of brightly colored fantasy adventures without words. Joan Benson ’46, a champion of the clavichord in the modern world, offers a method book for practitioners and enthusiasts alike, including a master class DVD and a CD of Benson performing. Reanne Hemingway-Douglass ’63 tells the little-known World War II story of an escape route that the French Resistance used to rescue Allied airmen shot down over France. Susan Levin ’84, professor of philosophy at Smith College, examines the famous philosopher’s evolving engagement with the subject of medicine and argues that his works have much to offer in the world of bioethics. In his sixth novel, Charles Neff ’54 revisits the Pacific Northwest, where a clash between an old family legacy, tribal land rights, and a marriage in trouble results in a suspicious death, threatening the lives of those who try to solve it. Assistant Professor of History Arash Khazeni examines the origins, trade, and circulation of turquoise in the history of Islamic Eurasia and global encounters between empire and nature. A National Book Award finalist, Professor of English Claudia Rankine’s meditation on race recounts the racial aggressions of daily life in America in a progression of revealing vignettes.